If you want to spend a nice holiday in prestigious Seminyak area, Bali, you have to try spending it in Kokonut Suites Hotel. Kokonut Suites is not only a fashionably designed hotel but also a spacious and luxurious resort. 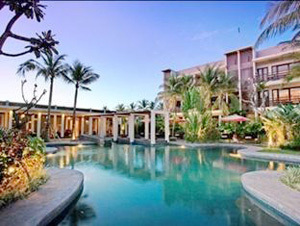 This hotel is built on 5000 square meters of total tranquil area, far away from the hustle and bustle of Seminyak itself. It offers a full freedom and peace holiday in the island of Gods. It is situated in a strategic location, just a walk away from the best restaurants, shops, and entertainments like Seminyak Square, Legian Beach, and Seminyak Beach. Also nearby is Kuta Galeria Shopping Arcade. There are many choices of one or two bedroom suites with private balcony. 33 comfortable and spacious rooms consists of 23 units of one bedroom suites, 1unit of bedroom suite plus private pool, and 9 units of two bedrooms suites. Each of them has the views of pretty rice fields and coconut trees landscape which could be enjoyed while staying in a room full of modern amenities. In-room facilities like living room, kitchen, bathroom, high speed internet connection, high definition plasma TV, international channels, and many more are fully provided for your comfort. In addition, all units at this 4-star hotel have kitchenettes with microwaves and refrigerators. Other facilities are uniquely shaped swimming pool, library, resort spa, fitness centre, Suka Suka Restaurant, bar and pool lounge, laundry facilities, Kids corner, and spacious parking area. There is a business center on site. Complimentary breakfast is served everyday. The staffs could also assist you to arrange a tour in this beautiful island. The staff can arrange tour/ticket assistance and tour assistance. Room service during limited hours is also available. We stayed at this hotel using Groupon vouchers. I don’t think it’s cheaper than the room rates one could get from online hotel booking sites, but the vouchers offer hotel transfer, one-hour massage, and one afternoon tea. So I expected these extras to make this deal worthwhile. However, I was quite disappointed with our stay. First the staff were very friendly. This was the best part of our stay. We had a one-bedroom suite. The size was good and the first impression after entering the room was quite positive – it looked modern and clean. However, very soon we found many problems. First, the aircon was so weak that it took so long to cool down the room. I changed it to 18 C and on “high” but still it was very weak. Furnitures were a bit old. One dining chair had its leather surface ripped out all over. The floor was marked in a few places. The wall was stained. Part of the bathroom wall that was made with glass was broken or stained. The safe did not work and they could not fix it. So they gave us a key. The free wifi was never stable – every few minutes we were disconnected and had to re-connect our ipad/ iphone again. The blinds don’t work so every morning at 6.30am we were woken up by bright sunlight. Breakfast was okay. There was something for everyone. We did not use the swimming pool but the pool area looked quite nice though very small. However, I was really disappointed at the massage. Even though our Groupon voucher includes a 60 minute massage, and the hotel front office did give us a voucher stating a 60 minute massage, when we went to our massage appointment, the spa staff were only interested in selling us other spa products. When we said we just wanted a massage, they said it would be for 45 minutes only. The worst thing was that after we accepted the 15 minute reduction in time, they gave a massage for only 30 minutes, and they looked very unhappy the whole time. It was a big cheat to cut down the massage time by half. Also I found the hygiene lacking as they did not change the sarong that covered the bed. Another disappointment was that I was not given the voucher for afternoon tea even though it was stated in the Groupon voucher. I could have asked them to issue it, but then I decided not to bother with it since I had enough of their food from the breakfast. Location wise, it was not great at all. It’s right next to a busy road. The biggest problem was there is no sidewalk in that part of Bali. It’s so dangerous to walk even to the restaurants nearby. To go to the nearest beach it needs a taxi. Traffic could be terrible. We did not like the beaches in the Seminyak area. They looked unclean. Taxi drivers also told us that those beaches were not very clean. We ended up going to Kuta beach which we found very nice with white sand. Taxi fare to Kuta beach was around IDR35000 one way with unacceptable traffic jams. Even though the hotel advertises that they have shuttles going to Seminyak, guests need to pre-arrange it a day before, otherwise they would just say all the drivers were unavailable. Overall it was an okay hotel for a sleep but I will not return to it. The spa was a big disappointment. I stayed here using a Groupon deal, which was worth the price. 2.) While it is quiet at night, accessing other areas after 9pm would be troublesome as taxi’s don’t often pass by the road at that time. 4.) Limited room service menu (again, it could be just us, but when we stayed in Bali, noon time was so hot, we decided to stay in until later in the afternoon, but the menu did not offer many choices. The most important thing when deciding to choose this hotel is the location. If you intend to do a lot of cheap shopping/beach going, Kokonut Suites will not be convenient. Better to choose a place in Kuta. If you prefer a quiet retreat with a little walk down Seminyak’s many adorable boutiques (which are also pricier) then hit a famous restaurant or night spot like Potato Head or Ku De Ta, this place will be perfect. Room Tip : Request a groundfloor suite for easy access to the pool.